VIRGINIA BEACH, Va.—Chesapeake Beach Civic League will hold the first CXB 5k & Paddleboard Classic, a paddleboard race and fun-run dubbed a “surf and turf” in the spirit of the historic Low Rent Regatta beginning at 8:30 a.m. Saturday, June 7, 2014 to benefit civic league special events and the community. The race course encompasses the neighborhood of Chesapeake Beach (Chic’s Beach) along the Chesapeake Bay. A family and community event, the 5 km race begins at HK on the Bay at 8:30 a.m. The first of the stand up paddleboard (SUP) portions beginning immediately after at Buoy 44 on the beach. The SUP portion will have four waves of start times 10:30 a.m. (men 14 feet and below class), 10:45 a.m. (women 14 feet and below), 11:00 a.m. (juniors 14 feet and below), 11:15 a.m. (legends 14 feet and below). 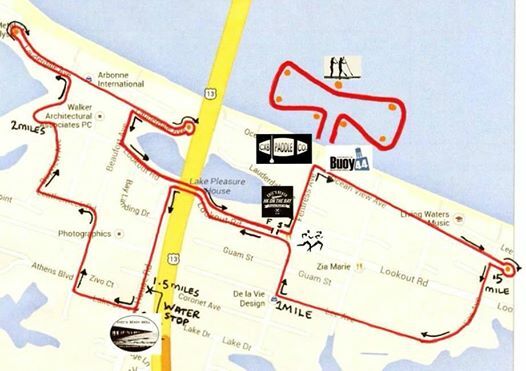 Racers may participate in the portion of their choice or the whole surf and turf event of road and paddleboard race. Board-less paddlers may rent boards the for the day of the race from CXB Paddle Company by calling 757 323-0201. For more information go to http://www.CXBcivicleague.org or the CXB 5K & Paddleboard Classic Facebook event site. Racers register at https://.raceit.com/Register/?event=27344, volunteers may register at https://www.raceit.com/Register/?event=27361 or go to Race-IT at http://www.raceit.com and search zip code 23455. Mike Hopkins, Chic’s Beach resident, has had the idea of a neighborhood race since moving to the area in 2007 and participating in organized races, running for fitness and pleasure. “I’ve always wanted to have a 5k in my neighborhood so that runners from other areas would get to feel that same spirit that propelled the Low Rent Regatta success all those years ago,” said Hopkins. Erin Hazlett and Bart Elling owners of CXB Paddle Company, also Chic’s Beach residents, joined with their SUP experience rounding out the surf and turf concept. “This event, to me, is a beautiful fusion of the things I am most passionate about: the one-of-a-kind, supportive community of Chic’s Beach that I am proud to call home; the dream job that has become a reality and the true love I have for the sport of paddleboarding,” said Hazlett. The civic league, led by President T.J. Morgan, unanimously voted to support the event promoting community spirit and participation. The referenced Low Rent Regatta began in the 1970’s as a spoof of a more professional catamaran race at the oceanfront. In the laid-back spirit of the bay beaches, Low Rent vessels merely needed floating capability to participate, making the race accessible to everyone. The popular race ran for about 20 years from the beaches near the former Alexander’s on the Bay—now Buoy 44. Current sponsors of the CXB 5k & Paddleboard Classic include Chic’s Beach Grill, The Lagoon, Froggies Cantina by the Bay, HK on the Bay, Buoy 44, CXB BBQ, CXB Paddle Company, Wilbanks, Smith & Thomas Asset Management, Chix Beach Gym and Cider Tires.